Madison Beach Hotel Wedding Photos show the beauty of the Connecticut shoreline as couples from all over celebrate their special days. The venue offers unobstructed views of the Long Island Sound shoreline from rooms within the hotel, and a furnished porch that directly overlooks the Long Island Sound. For a wedding reception, the hotel accommodates up to 200 guests. After the celebrations, elegantly decorated rooms are available at the hotel for wedding guests to rest in, giving them a place to stay that is only a few feet from the party. The best Madison Beach Hotel Wedding Photos come from taking the couples to walk along the shore. 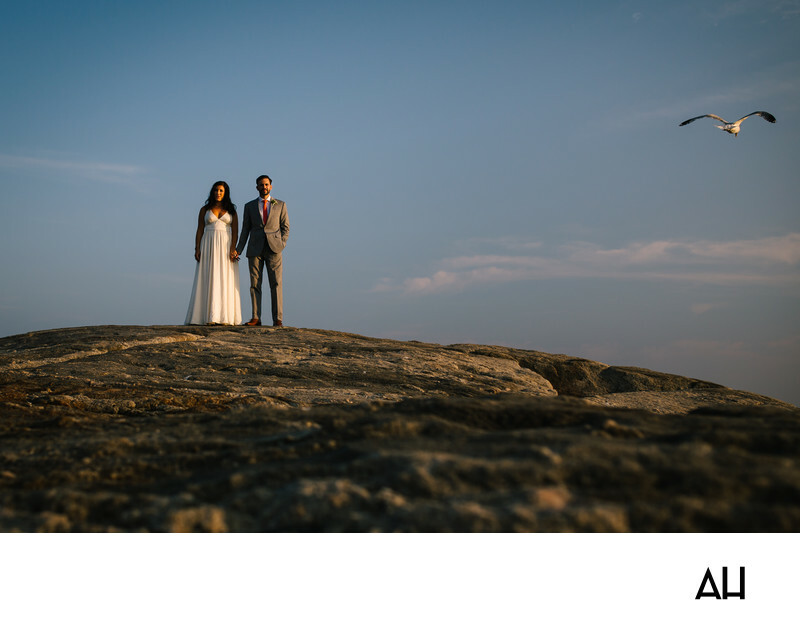 The picture above shows the bride and groom uptop a large rocky area, overlooking the calm of the water. They appear as two solitary figures in this instant. Like a princess and her prince, who have just traveled from afar to come to this moment. They have planned for this day to celebrate the journey of their relationship thus far. The pair exudes contentment, surrounded by blue skies and fresh sea air. The rock adds texture to the picture and its surface is highlighted by the light of the sun. The image of the couple, standing so steadfast on this rock by the sea gives the impression that the two will be able to handle anything that the future brings. All they need to do is hold on to each other.